Since April 2013, we have rescued more than 2,000 dogs and we’re proud to partner with local businesses in that effort. The support of the local business community helps to ensure Fetch has the resources it needs and these dogs, who go on to become happy and much-loved family dogs, are given a second chance at life. As an all-volunteer effort, 100% of proceeds from the 5K will support our rescue efforts throughout 2019. Your partnership allows us to work towards our mission, while providing exposure for your business. Please select a level and complete the registration form below to become a sponsor. If you have any questions about it, please contact us at fetchwirescue@gmail.com. Anything else you'd like us to know about your sponsorship? Thank you for being a sponsor for the Fetch 5K. Our 5K sponsor coordinator will reach out to you to collect further information as the walk approaches. You can mail your sponsorship fee to Fetch WI Rescue, PO Box 930572, Verona, WI 53575, or donate it on our website. Please donate your sponsor fee on our Donate page. 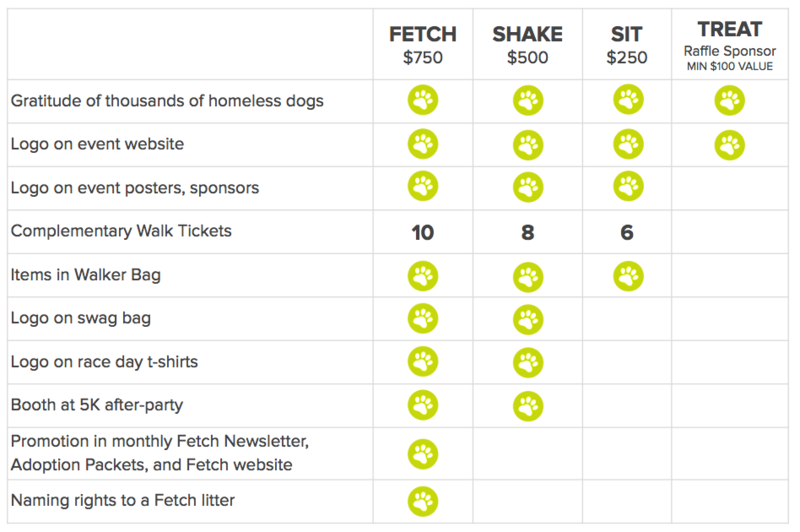 Fetch will contact you upon receipt of your sponsorship. Feel free to contact us in the meantime at fetchwirescue@gmail.com.